Carl Kolchak, hard-bitten reporter of the supernatural from the TV series “Kolchak: The Night Stalker” of the 1970s returns to action courtesy of an ongoing series of comic books and graphic novels from Moonstone Books. This time, Carl’s been fired by the owner of the newspaper that used to employ him, and he must find another way to make ends meet. He’s approached by a young couple, Otto and Mo Brerhahrer, who are ghost hunters in their spare time, and Kolchak can hardly say no, particularly when they offer to buy him lunch. Through three related vignettes, the reader learns more about Kolchak, and why he has such a close connection to the supernatural. The first, titled “Fifteen Minutes,” find Kolchak at his wits end regarding where his next meal is coming from. He decides to get in touch with a young couple he met at a recent funeral – their interest in the supernatural seemed fortuitous, and at the time they had expressed an interest in hiring him to do some writing work for them. As it turns out, the offer wasn’t completely genuine but it was sincere, and Kolchak is intrigued. In the second story, “Blood,” Kolchak is attempting to network with other reporters at a press conference to find work. The company holding forth, Windsor Chemical, is being investigated for illegal dumping. Abandoning the networking effort as a lost cause, Kolchak heads home; later that night, a mysterious and beautiful woman visits him, wanting to hire him to investigate the circumstances surrounding Windsor Chemicals. What Kolchak finds is murder, and more deaths to come. In story number three, “A Clue To The Truth,” Kolchak is sent by Otto Brerhahrer – a ghost hunter from the first tale – to interview a local expert on the supernatural in order to give himself a better background understanding of ghosts. Kolchak finds himself losing track of the time during his lengthy conversation with Doctor Robert M. Carter; he finally excuses himself hours after he arrived, thanking Dr. Carter profusely for being such an engaging conversationalist. When he meets with Otto the next morning, Otto has news that shocks Kolchak to the core. This is an entertaining series of tales, and I found myself at the end wishing there was more to read and enjoy. Comics are a fantastic medium for this type of story, and the crew presented here – writers Dave Ulanski, Tom DeFalco and C.J. Henderson, Pencilers Dan Dougherty, Ron Frenz and Ron Harris, letters Bill Halliard and Nate Pride and inkers Sal Buscema and Keith Williams – do a great job on this issue. The story “Blood” particularly reminds me of the classic style of the Creepy and Eerie magazines from the 1970s. Perhaps cheesy and sometimes predictable, Kolchak stories still entertain by virtue of the namesake character, a good-hearted everyman who has an affinity for the strange and peculiar, and while not totally fearless, Kolchak has the guts to do the legwork and actually get to the bottom of the situation. 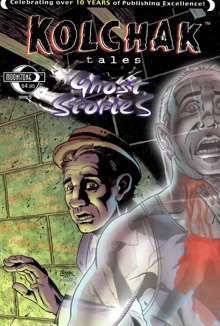 Kolchak Tales: Ghost Stories is a fun read and a great way to spend a dark stormy night.